As mentioned earlier, you have an advantage as a retailer. You have a personal one-to-one relationship with your clientele. Your feedback comes directly from your customers. You are the first to know when a style is great and you will need to reorder. You are also the first to know when a style is a dog and should be marked down. 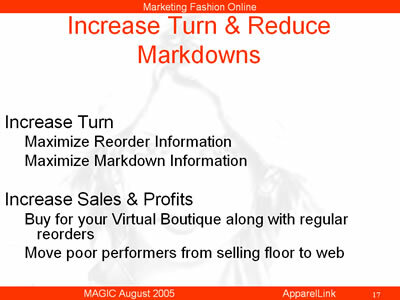 Here is where your virtual boutique offers another great advantage: Strong items can be reordered in greater quantities than your square footage and traffic would otherwise justify, while markdowns can be taken on your web site in a timely manner and be sold before they get too shopworn on a markdown rack. Timing is critical! You must be able to add items, modify prices and inventory, and delete sold out items to your web site in near-real time. Just as in your store, you can’t leave a sold-out item on display.